Oh snap, yall! It’s Girl Scout cookie season. Or if you’re me, it’s always Girl Scout cookie season because I stock up on that mess. That’s right, I hoard boxes of Samoas, Thin Mints, and Tagalongs like it’s my j-o-b. And in my alternate universe, I like to think it actually is. Can you imagine? Being paid to stockpile Girl Scout cookies? I’d be rich. RIIIIIICH! Anyway, what? 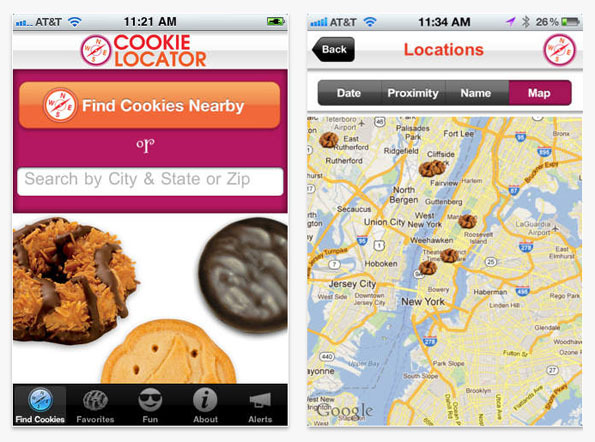 For you poor planners, there’s Cookie Locator, a free app that maps out where you can buy Girl Scout cookies. Currently, it’s only available for iPhone users so you know what that means: if you’re using any other advice, then now it’s time to make the switch. Now just because I’ve got my garage piled full of these boxed delacacies doesn’t mean I’m not gonna hit up every single location within a 50 mile radius. What it does mean is I’m gonna continue to be full of cookies for the forseeable future. At least until 2026. Download the life changing app HERE.